MAJESTIC 6-Oz. Plastic Dessert Bowls | 40 Pack | White with Gold Speckled Rim | Disposable | For Weddings, Parties, Holidays & Occasions. QUALITY: Heavyweight premium quality plastic to ensure no sagging, tearing or breaking. Made with the highest quality materials, printed with Food-Safe Inks. 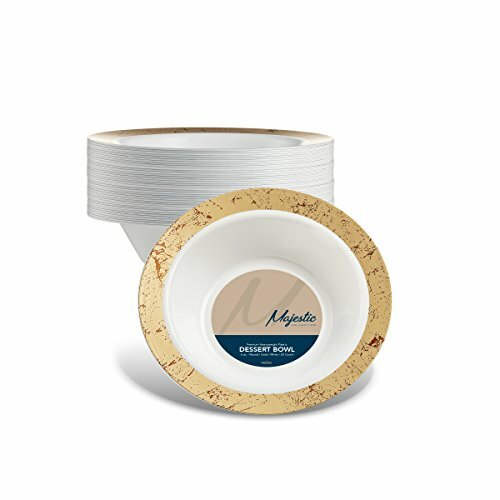 INCLUDED: (40) 6-Ounce Plastic White Bowls with Gold Speckled Rims | PACKAGING: we use strong durable packaging to guarantee that these bowls will arrive in the best condition possible. MODERN FLARE: High Gloss Shine | Stark Snow White | Gold Speckled Rim | Modern but Tradtional | All these characterize our Majestic collection. Great for Graduations, Baby Showers, Camping, Picnics, Weddings, Anniversary's and More!